Repair Time – far too many minutes! I covered unboxing and assembly in The Drone Diaries Part 4 so you may recall that unlike the tiny Eachine E50, this one has it’s own controller. The controller needs 4 AA batteries. Nothing unusual in that. Except that when I switched on both the controller and the drone, not much happened. I had a picture on the screen sent from the drone’s camera, but none of the controller’s buttons did anything except beep. The display shows battery status, both the big one in the drone, and the 4 AAs. The latter were not fully charged so I decided that might be a problem. And if that meant I was going to need a lot of AAs, I figured I might as well buy some rechargeable ones … plus of course, a charger. That meant a quick trip down to Sichon. Then I had to wait patiently for the AAs to charge. A mere twelve hours. So eventually I was able to put four fully-charged AAs into the controller, and … nothing! The controller was acting as though it didn’t have batteries. Now, I know rechargeable batteries can have a mind of their own, so I decided to discharge them and recharge one more time. This involved two turned-on flashlights and another twenty-four hours. And after all that… still nothing. I couldn’t figure then, and I can’t figure now, how a device knows it’s using rechargeable batteries, nor why it would care. But, I rushed out to the nearest 7-Eleven to buy normal AAs. Et voilà. The controller powered up. However; it still wouldn’t “talk” to the drone. A day and a half wasted. Well, I thought, maybe the drone’s rechargeable battery is also temperamental. I decided to remove it and recharge it. Now; I hadn’t realized the drone was still turned on, and as I removed the battery I saw some lights flash. The drone has lots of lights. Red and green LEDs underneath. Some blueish LEDs on the front, and two green and one red LED on the camera. Or is it two red… no matter. They all indicate something, but until you can get everything working, you have no idea what. 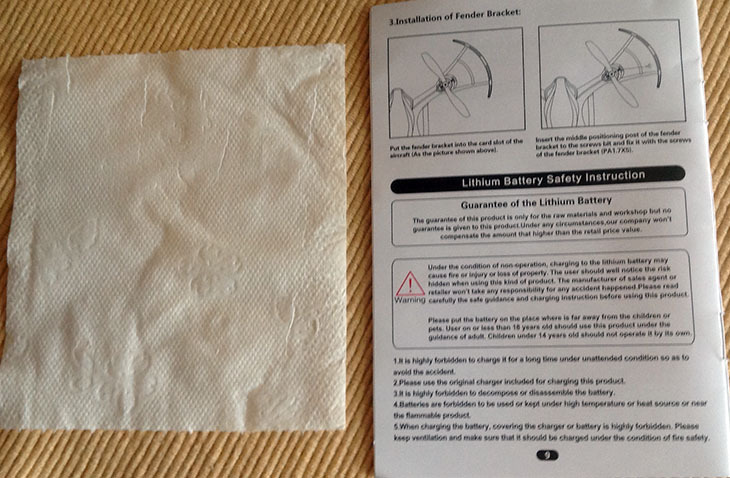 The toilet paper sized “User Guide” … and I’m talking about one sheet … tells you next to nothing, and unless you have a magnifying glass, tells you absolutely nothing. One sheet of toilet paper would be more useful. At least it has a purpose! So about all I could assume was that the battery wasn’t properly connected. I fiddled and diddled until all the LED lights were flashing in some kind of sequence, and then decided to try to power up the drone. But how? Again, the User Guide is next to useless. You have to watch Youtube videos of Cheerson CX-35 reviews, wait for moment the motors start and then try to figure how that happened. If you watch really carefully, you can see that the left joy stick has to be moved straight up and then straight down – accompanied by beeps – in order to pair, or “bind” the controller to the drone. It’s a bit like pairing a bluetooth device. But I still hadn’t started the motors. For this, you have to move simultaneously the left stick to the bottom left corner and the right stick to the bottom right corner, and which point you just about jump out of your skin as it comes alive. Okay I thought, I’m going to make sure it will try to take off, while I hold one hand firmly on top. Hmm, despite the draught which scattered all the papers in my office, it seemed to be trying to force its way down through my desk. Back to the toilet paper… ermm… User Guide. Tucked away on the last page, well after the assembly instructions, it mentioned something about propellers “A” and “B”. Yes, they have almost unreadable labels, as do the motors, and needless to say, I’d put all four in the wrong places. That fixed, and more paper scattering draughts, and we had lift off. Well, if I hadn’t been holding it down. Okay, this all seemed good. Problems solved. So I walked out the house, down the road, and turned right to the nearest field. I turned on the controller and the drone, and it was back to square one. No communication between controller and drone. This was getting tedious. I went through this routine three times … back to house, fiddle with the connector, back to field, shock the neighbors with my language, back to house, until finally I gave up. Next day I turned everything on, and you wouldn’t have known there had ever been a problem. Utterly bizarre. So I went for a short flight. Landing in the long grass was deliberate. Honest. But a bad idea. Thai grass seems to be really tough, and it wraps itself around the props. I need to go flying with a knife in my pocket. That was late evening. So I charged-up the battery again and early next morning I drove along the beach road to a nice open field with really short grass. That’s because it’s usually full of cows. And that means you need to be careful where you step … and land! A slightly better landing, but here’s the problem. Well, two problems. 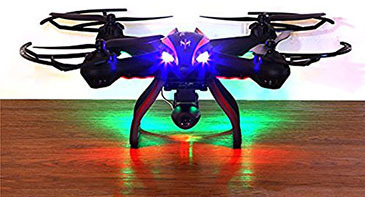 The legs are very small compared with the total width of the drone, so it tips very easily. I need to see if I can find some way of making a wider landing gear. And, to switch off the motors, you have to do the same thing as starting them. Moving the two sticks down and out means the drone tries to turn and roll before it decides “Oh, you want to stop the motors.” I need to think about this, maybe there’s another way. And I’ll have lots of thinking time, because the blardy thing has gone back into not working mode. Really irritating. I had a whole learning plan worked out, and now it’s all on hold. I’ve contacted the seller, but so far no reply. It’ll be back to tootling while we all wait. I have another trip over to Krabi sketched out. Maybe tomorrow.